Charles Best was a Bronx high school teacher with a question: How could he raise the funds needed to outfit his classroom with much-needed supplies without having to keep opening his own wallet? Turns out other teachers had the same question. So, Mr. Best came up with a brilliant, yet simple, answer. DonorsChoose.org – a site where teachers can list their students’ needs and “where anyone with $5 can be a philanthropist” to help meet those needs. Three years later, the stuff of fairytales happened when Oprah mentioned DonorsChoose on her show and $250,000 worth of donations came pouring in from viewers. It wasn’t long before other notables, such as Stephen Colbert (who is now also on DonorsChoose BOD) caught on and the site catapulted from being one man’s brilliant idea to a national effort supported by millions. Hence, they are thrilled that Charles Best, the man behind one of Fast Company’s, 50 Most Innovative Companies in the World, agreed to spend a virtual five minutes with them and talk about, well… everything! – What sparked your innovative idea? As a teacher in the Bronx, my colleagues and I would sit around the lunchroom and talk about the experiences we had in school growing up – books we read, field trips we went on, the microscopes and instruments we had in class. Our students didn’t have those things. It occurred to me that, if there was a website where teachers could request the things they needed for their students, maybe people would want to fund those classroom projects. – What do you think made the difference and finally got people to listen to you? I convinced my colleagues to post the first several projects on the site. Since I was still living at home, I funded the first several projects anonymously, and my aunt also donated. It gave people the impression that the site worked, and that there were people out there ready to fund their projects! It didn’t take long for word to spread across the Bronx. As we’ve grown, we’ve had a few great boosts to help us spread the word about DonorsChoose.org. When Oprah featured us on her show, it literally crashed the site. Stephen Colbert, who is now on our Board of Directors, has also done several campaigns for us on his show, and gives every one of his guests a DonorsChoose.org gift card. Most recently, Fast Company made us their cover story, naming us #9 on their list of The World’s 50 Most Innovative Companies. Every time someone shines a spotlight our way, we’re able to help more teachers. – Do you think that the model of crowdfunding you created with DonorsChoose.org can be applied for other organizations/groups in need such as animal welfare or fighting hunger? It definitely can – and it already has. LoveAnimals.org is a crowdfunding nonprofit that funds animal welfare projects. Groups like Watsi and PossibleHealth are supporting global healthcare initiatives. Every cause area has its own challenges, but if it’s something people are compelled to support, crowdfunding can be a scalable solution. – Do you believe that internet based philanthropy can work in countries outside of the U.S., such as Greece? We’ve seen the Internet transform countries around the world, whether it’s a Twitter revolution that topples a regime, or microlending that’s creating commerce in impoverished nations. The same can be said for philanthropy, but there’s one essential ingredient: transparency. People want to see their dollars put to good use. That’s why the thank you messages and project photos are so critical to DonorsChoose.org. People don’t want to just write a check – they want to see results, and that’s true anywhere. – All entrepreneurs have a, “What have I gotten myself into?” moment. What was yours and what encouraged you to keep steadfast in your goals? Soon after our 1st birthday, we ran so low on operating funds that I prepared to shut down DonorsChoose.org. I resolved that, if we did not receive an angel investment within the next few weeks, I would be at peace with concluding our experiment in democratized philanthropy. But lo and behold, we received our first $100,000 grant that sustained us for the next two years! – Out of DonorsChoose vast impressive accomplishments (some are truly mind-boggling! ), is there any one accomplishment that you are especially proud of? Recruiting Stephen Colbert to join our board of directors! 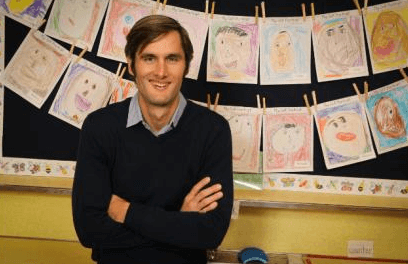 – What’s next for DonorsChoose? Our “big hairy audacious goal” – or BHAG – is to have 1 million people give $100 million to 100% of America’s highest poverty schools, all within one school year. We think we’re about 3 years out from hitting some of those milestones. 1. We can connect teachers with entrepreneurs and inventors to introduce new innovation into the classroom. We’ve done that just in the past year by helping MakerBot and OpenROV get 3D printers and underwater robots, respectively, into classrooms. 2. We can open our data to the public to make education spending smarter. We have data scientists who are already digging into our 15 years of teacher requests. We’ve also made our data available to anyone who wants to hack some great insights into what teachers most need across the country. 3. We have a platform to reward teachers who bring new learning opportunities to their students. By offering DonorsChoose.org funding credits to teachers who start a new AP course or teach their kids to code, we can empower teachers and ensure they have what they need to expand their curriculum. The Creative Economy International Event was a resounding success! Copyrught © 2019 - All Rights Reserved.